The uprising of thousands of Kazerun's people, especially the brave youth, continued on the afternoon of April 29th for the fifth day. The demonstration was held while the city's fake council and Friday prayer preacher and government media outlawed any gathering until the Kazerun city separation plan is determined. The protesters who had gathered in the Shohada (martyrs) square chanted: Do not be afraid, do not be afraid, we are all together; we swear to the blood of the martyrs that we shall gather every day at the martyrs' square; we do not accept humiliation; While our enemy is right here, they keep saying America is the enemy; we are the men and women of battle, we fight against the separation plan ... Demonstrators, among whom were brave women who played a significant role, called unity and solidarity as a need for resistance against the conspiracies of the regime and preventing repression of protests. 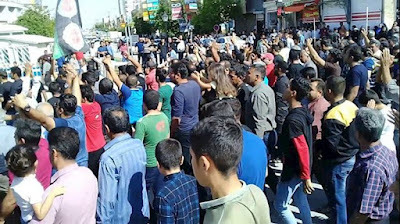 Following the courageous demonstration of the people of Kazerun, some local authorities announced on Wednesday that the plan for the separation of Kazerun was paused. People did not pay any attention to their promises and demanded the governor to respond. - Employees of Narges Shiraz Vegetable Oil Company gathered in front of the governorate in protest of failure to pay their salary for three months. - The repressive forces attacked the houses of farmers of Varzaneh in Isfahan and destroyed their belongings and the doors and windows of their houses. On Tuesday, farmers in the Argasht mountain district of Isfahan destroyed five electricity poles of Zayandeh Rud water pumping station in protest of denying their right to water. - On Tuesday, the people looted by the Alborz Development Institute in Tehran demonstrated in front of the Central Bank, and the people looted by the Arman Vahdat Institute in Ahwaz demonstrated in front of the institute’s branch in Khuzestan province and chanted slogans against the government. - In Gachsaran, the people looted by the Arman Vahdat institute closed the door of the institute and shut it down. - A group of Tehran Agency drivers gathered outside the city council in protest of an increase in the traffic plan rate, which suddenly increased from 650 thousand tomans to more than 4 million tomans. - Tarbiat Modarres students protested for the fourth straight day outside the central office of the university in Tehran.